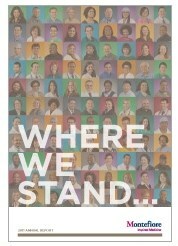 Montefiore’s 2011 Annual Report Where We Stand captures a period of remarkable growth and a focus on our patients’ experience. The best way to tell Montefiore’s story is through the voices of our patients and their families, a number of whom share their Montefiore experiences in this new publication. We invite you to flip through the online version of Where We Stand to learn more about Montefiore’s leadership, at the forefront of science-driven, patient-centered care.